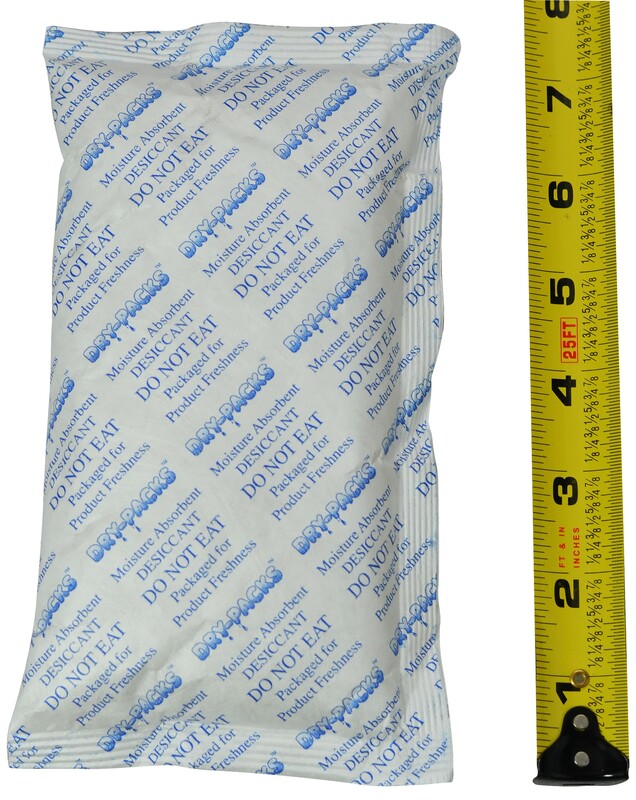 224 Gram Silica Gel Packet (Tyvek®) is used to absorb moisture and prevent Mold, Mildew, Corrosion, and Fogging. Silica Gel Desiccant 224 Gram Tyvek® Packet (known as 8 Unit) - A unit of Silica Gel is a trade term equal to 28 grams and does not represent the number of packets you will receive. The 224 gram silica gel packets weigh 224 grams. Dimensions are 7.5" x 4.5" in width. Silica Gel packaged in Tyvek® meets FDA Requirements and is the industry standard for dry food packaging. When used in closed places (where mold, mildew & fungus live and breed) silica gel whisks away moisture to create a protective environment of dry air. It prevents all forms of rust, corrosion, oxidation, mildew, fungus, mold, fogging, etc. Silica Gel is used to prevent tarnish on gold and silver, in your tool box to protect your precious tools from rusting, or drop some in your camera bag to protect your camera and equipment. It even protects expensive leather items like jackets, shoes, and boots. Also great for tackle boxes, photo albums, computer media storage, gun cases, ammo boxes, coin collections, camping gear, backpacks, campers, electronics, etc. Copyright © 2019 DesiccantPackets.com. All Rights Reserved.